I moved my snap peas outside today. It's still cold outside, and periodically it freezes overnight a little, but according to the seed packet, snap peas are "frost resistant." We're not expecting any serious freezes for the rest of this season, so I think they'll be fine. 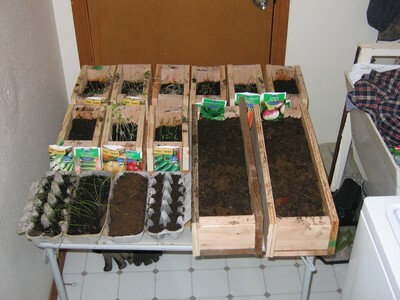 The snap peas occupied two of my little planter boxes, so I had more room to plant some more seeds. I also had another cardboard egg carton to use, and since I had some more scrap wood, I figured I'd make even more boxes. If you've done the math, you'll notice that I only have six additional spaces available for planting, yet I have seven items in the list. Yeah... I accidentally planted both the oregano and the sunflowers in the same box. oops. Neither have an official "harvest" date, so I guess it doesn't really mater. 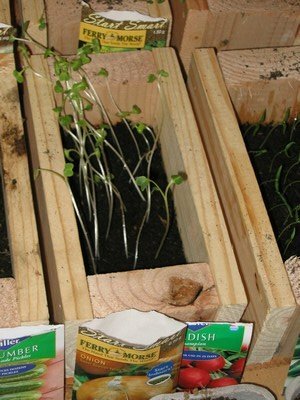 The sunflowers will probably get too large for the box pretty soon, but there are so many oregano seeds planted that it's not going to make too much impact when I take the sunflowers out. My existing plants are doing well. The radishes, which were the first to sprout up, are still doing well, although they didn't grow as quickly as the snap peas did. 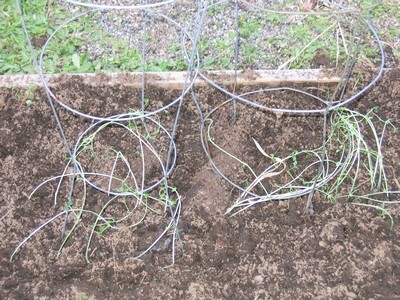 Those snap peas shot up and grew over a foot in the course of a couple of days. Crazy. 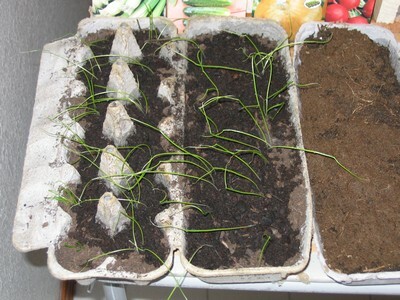 The egg carton onions are doing well, and are a few inches away from requiring a larger planter. The jalapeños worried me at first, but it turns out that they just take a little while to break through the dirt. Once they're up, they take off pretty quickly. 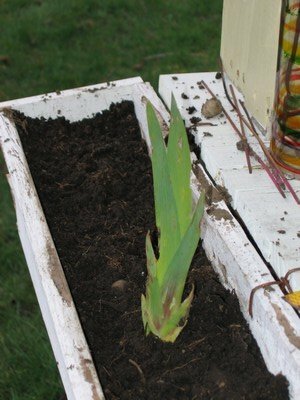 After planting the snap peas outside, I noticed some bulb-based flowers were getting big, so I moved one of them to my wife's potting bench that I built for her a while back. I'll try to find some other flowers that'll look in the bench as well, once some more start sprouting up. 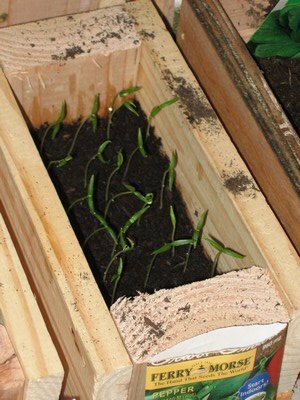 I also moved a rogue strawberry plant into one of my potting boxes, giving it some room to grow. Last year, I moved one of my two blueberry bushes from behind the back of a shed to out in the open, where it could get more sunlight. I have no clue why the previous owners of the house put the bushes in the shade (they thrive in sunlight), but I figured I'd see if I could successfully transplant it. The bush survived the transplant, but produced no blueberries last season. Incidentally, that bush has never produced blueberries over the past 3 years I've been here, which is exactly why I was comfortable moving it. Today, I moved the productive bush, comfortable with my ability to transplant mature blueberry bushes. 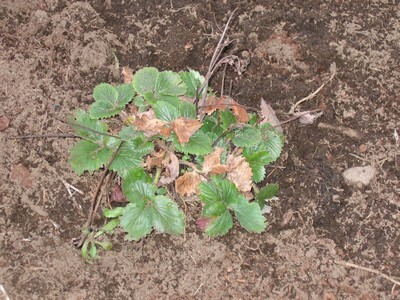 Hopefully the transplant is successful, and that I get a bounty of berries this coming season. We'll see. How's everyone doing in the snow? Our crocuses look very pretty--purple and yellow against white--but cold. Not too bad. It's not *fun* snow, though. And it didn't last very long.